The key inventive step in the Honeycomb apartment concept is the elimination of corridors and replacing them instead with of sky-courts. Re-inventing how residents are connected from the public street to their individual apartments overcomes the social problems that have been linked to the nature of corridors and “intermediate space” but also opens up to various ways of reducing costs. The chart below that breaks down the selling price of a typical apartment helps us better understand by how much the checkerboard can help make housing affordable. Here the components that make up the price of a typical apartment is listed with the bigger costs at the bottom. 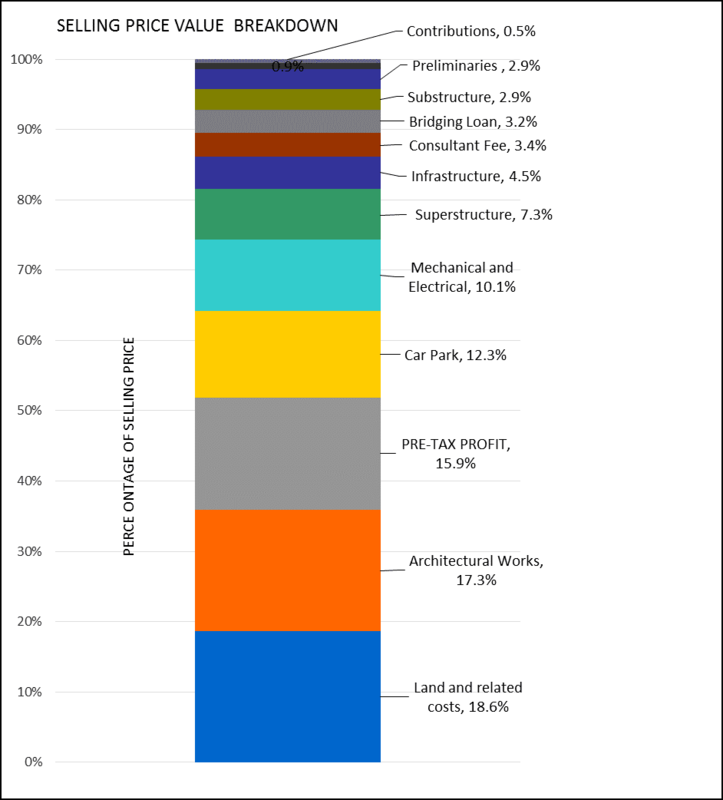 In this example, the biggest cost factor is land followed by the cost of architectural works, profit, car park, M&E services, superstructure, infrastructure, consultant’s fees, bridging loan, substructure, preliminaries, marketing costs and contributions. Most significantly, higher densities also allow the cost of land for each unit to be substantially reduced: more units share the cost of the land. By radically reducing corridors and improving the plan efficiency, the gross floor area is reduced, and the cost of architectural works is reduced in the same way. By reducing the gross area and the number of floors needed to support the set number of car parks, the cost of building them is substantially reduced. With fewer lifts, their costs and the costs of gen-sets and electrical supply supporting them go down. Lower fire-risk of shorter buildings also bring down the M&E costs. The lower GFA and smaller columns needed to support a shorter building reduce the structural cost. More units share the cost of infrastructure that is based on land size. The interest payable for the bridging loan is lower when the building is finished faster. 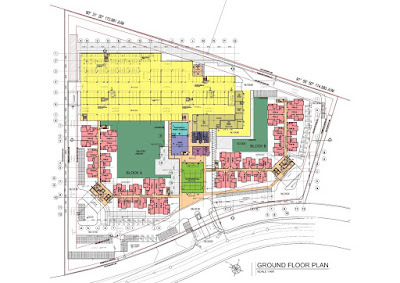 The preliminaries lower due to lower cranage and if the building is finished faster. Marketing costs is lower when the apartment has desirable features found in more expensive products. More units share the cost of contributions that is based on land size. From this list, all but two of the cost-centres mentioned above have been affected. But these two factors – profit and consultant fees – are calculated based on a percentage of development cost and when this has been substantially reduced, so can the amount of profit and fees for consultants. So, in both direct and indirect ways, we have shown that ALL the cost-centres have been tackled by the checkerboard design. This validates the strategy that we have adopted. To really reduce the cost of homes to make them affordable, re-looking at the apartment typology and re-designing it from first principles offers a way forward. All these cost-savings point to checkerboard-plan apartments to be even cheaper to build than conventional high-rise. 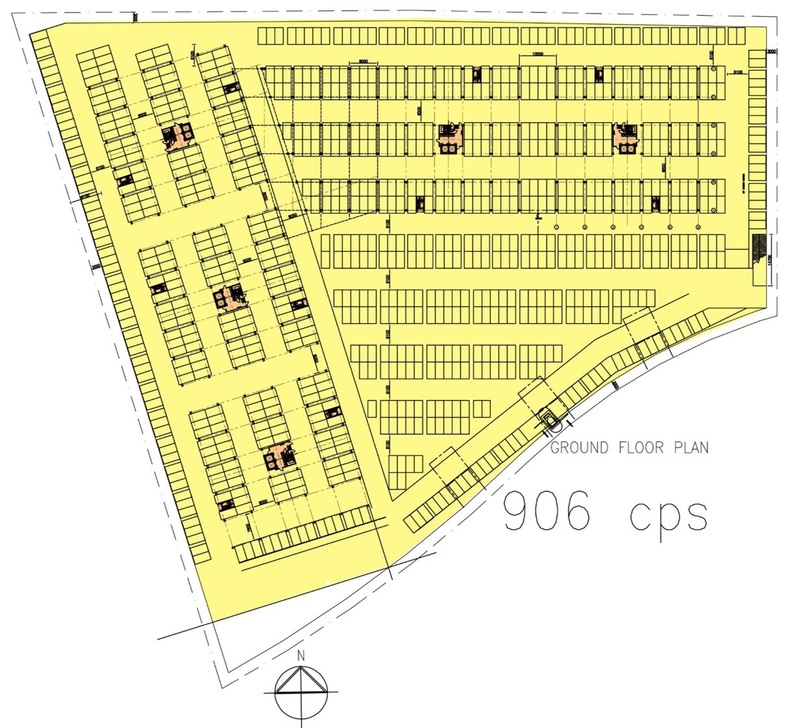 A preliminary estimate of all the savings discussed above indicates that it is possible for affordable housing below RM300 per square foot to be provided in the major city centres where the price of land is within RM300 per square foot and where the density permitted is 130 units an acre and the parking standard is 2.2 car park per unit. A study has been done to compare an actual project with a hypothetical Honeycomb alternative on the same site. 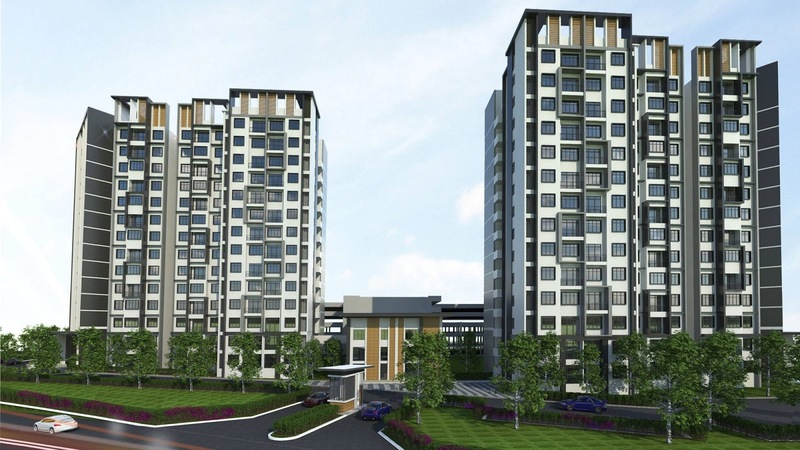 We were able to enlist the help of the Quantity Surveyor of a real project near Putrajaya by PR1MA, a government-owned company tasked with delivering 500,000 affordable homes by 2020. At the time of writing, the project was at piling stage. 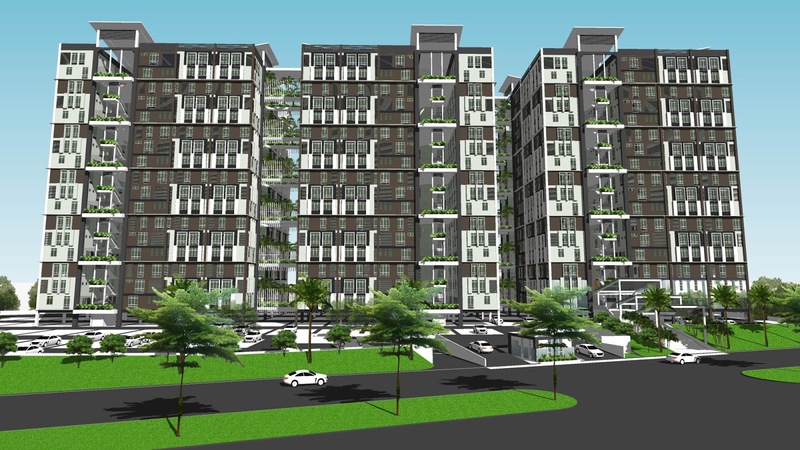 Against this existing project based on a conventional design, a Honeycomb alternative was designed and it was costed by the Quantity Surveyor using information provided by Arkitek M Ghazali and its Structural and M&E engineers. The initial result shows that the potential savings are as substantial as we expected. The following table presents a summary. Instead of two 15-storey blocks with a separate 6-storey car park block, we just had five 8 storey blocks on the car parking all on the ground floor. Naturally, there was a reduction in the construction cost per square foot of gross built-up area (GFA): just over 9% from RM119 to RM109. The average Net Saleable Area for each unit of only 88.11sm is increased by 21% to 106.75sm, but allied with a slight reduction in Gross Development Area: the efficiency of the layout, i.e. The Net Saleable Area as a percentage of the Gross Development Area has greatly increased from 49% to 60%. This means that there is a huge reduction in the construction cost per square foot of Net Sellable area of just over 24.8% from RM242 to RM182! 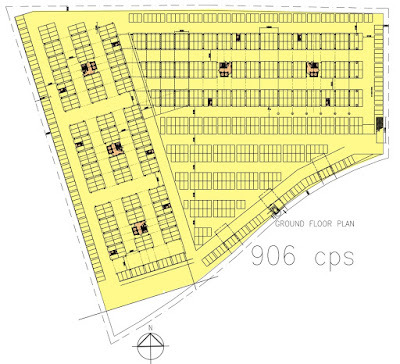 In this example, the Honeycomb alternative had a slightly lower density, 62 units per acre instead of 70. But with bigger units the Net Plot Ratio slightly increases from 1.52 to 1.56, causing a slight reduction in land cost per square foot of saleable area. With the land priced at only RM80 per square foot, the effect is not large. However, with important land component of development costs virtually unchanged, the large reduction in construction cost has a more moderate effect on Selling Price: the alternative design can be sold at the average price of RM273 per square foot instead of RM323, a reduction of about 15%. Two 15-storey apartment block and a separate 6-storey car park block with amenities and facilities. Five 9-storey linked honeycomb blocks apartments with facilities and entrance on the 1st floor of one block and car parks all on the ground floor. This is well in the middle of our estimate for the cost savings achievable by the Honeycomb Apartment layout compared with conventional design. 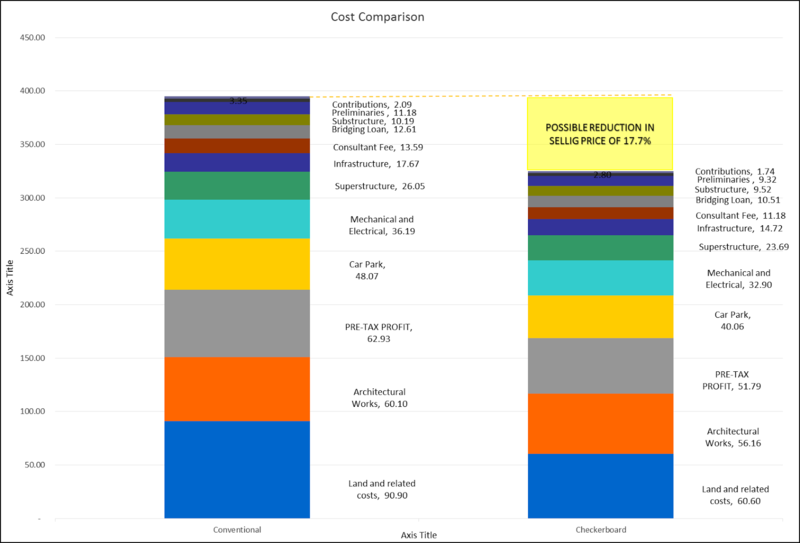 In this example, cost savings from construction was maximized and potential cost savings from land was not exploited because the land price was relatively cheap. 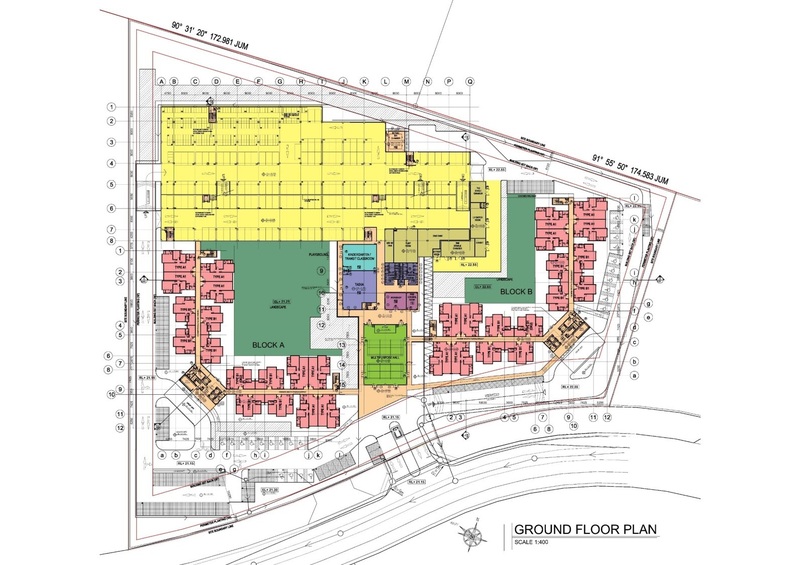 At RM80 per square foot, the potential savings from land did not merit the added cost of adding more residential floors and digging in a half basement car park. However, in cases where land is more expensive, the calculation would yield a different result. Architects are not well known for helping to cut the cost of construction: it is said that every line an architect draws add cost. If so, it’s better that we not draw anything at all, just let the engineers or builders do it. I write this only half-jokingly because it is a very common perception and, after these 20 chapters, I hope to have shown it to be wrong. When I was one of several architects doing low-cost mass housing work for in the late 90’s, the client had in mind that we adopt a standard design and the design responsibility of each architect was to do the make -up work on the façade to give some sort of identity to each project. The hope at that time was that the standardized design of housing units would allow Industrial Building Systems of constructions to be adopted, taking advantage of the large numbers of repetitive elements to be manufactured and assembled. Speeding up construction time, minimizing wet trades on site, taking advantage of economies of scale, manufacturing techniques and reducing labour, especially the need for skilled labour, all these can surely help reduce the cost of building homes. But we must take a realistic perspective. The cost of constructing a house is an important cost centre but it’s not the only one. There is the land to acquire, infrastructural services to provide and many other development costs to bear. Even just looking at construction costs, IBS mainly affects the cost of structural and wall elements, which in conventional construction only makes up about half of the building cost. If structure and walls make up only half of the building cost and building cost contribute to only, say, 50% of the selling price of a home, then an IBS method of construction that involves only structure and wall directly attacks only a 24% component of the cost of construction, equivalent to roughly 12% of the price that a buyer pays for the home. So, if an IBS system saves 10% off the cost of structure and walls, this can only deliver a 1.2% reduction in price. From my experience, it is unrealistic to expect savings of more than a few percent of the total construction cost. So, whilst better methods of construction should be pursued, we also must look for ways to reduce the cost of infrastructure, land and other costs. This is where design can help. Not just another iteration of existing apartment typologies, but a more fundamental re-examination of how homes have been designed. This is the basis of our research into new typologies. 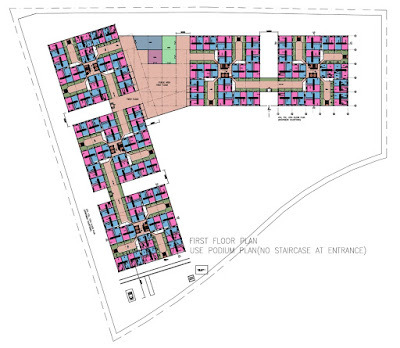 In our Honeycomb Townhouse concept, compared to terrace houses, there is at least 50% more units on each acre of land and construction cost is also lower due to the sharing of roof, suspended floor and foundation between the upstairs and downstairs unit. Compared to conventional terrace townhouses, both the upper and lower-level units have gardens, two car parks and ample window openings for all the rooms. We have shown at our project in Alor Gajah that if priced about 20% lower than a terrace house with the same floor area, people will buy them. We have discovered through experience that five-storey walk-up flat is the cheapest housing typology in Malaysia. However, the two highest floors were hard to sell even when sold at the heavily subsidized prices. The V-shaped Honeycomb Medium-Rise concept provides a very inexpensive lift that only shuttles between the ground floor and 3rd floor to serve all units, a communal courtyard for all, and private front-yards for some units, at an attractive block layout that achieves a density that is about four times that of terrace houses. It is envisaged that if the typical apartment is priced about 20% lower than a terrace townhouse and 40% lower than a terrace house, people will buy them. This new concept might be suited at the edge of small towns. In the suburbs of major urban centres where developers must provide low-cost housing, we have come up with the Kotapuri concept where the low-cost and low medium cost housing, priced between RM42,000 to RM100,000 are placed on top of shops. Although sold at a loss, the marginal cost of building each unit of low-medium cost unit is lower than its price; the marginal cost of building each unit of heavily subsidized low-cost unit is not too much higher than its price. In this case, the shops pay for the land and much of the infrastructure cost. In locations where there is no demand for offices above shops, it is better to use the space above it to provide housing units that liven up the area and provide housing for the people who tend the shops. Designed and managed properly the commercial and residential components can add value to one another. In this way, the subsidized houses are located near amenities and public transport rather than shunted to the furthest, least attractive corner of a development. In the Honeycomb apartment concept, the key inventive step is the elimination of corridors and replacing them instead with of sky-courts. Re-inventing how residents are connected from the public street to their individual apartments overcomes the social problems that have been linked to the nature of corridors and “intermediate space” but also opens up to various ways of reducing costs, making it possible to reduce pricing by up to 20%. At the same time, we offer products that are more desirable, that can overcome the major social defects of high-density high-rise housing. In the last few years, private and public developers have concentrated either on landed property that are expensive due to the escalating cost of land or else on high-density high-rise block that are very expensive to construct. 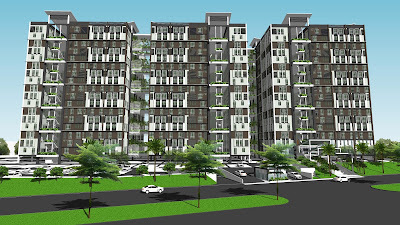 These new low and medium-rise Honeycomb designs provide a wider range of alternatives that can serve an important gap in the housing market between terrace houses and high-rise apartments that most Malaysians cannot afford, and the subsidized low-cost and affordable housing that either lose money or provide thin margins.